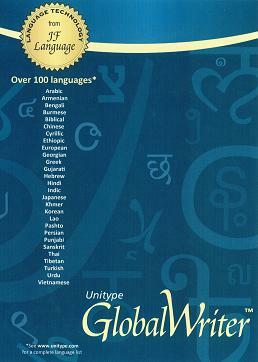 Multilingual software for Windows: Global Writer is a stand-alone multilingual word processor that allows you to type over 100 different languages. Supports mixing right-to-left languages like Arabic and Hebrew with left-to-right languages. Allows you to mix languages in any combination. Includes spell checking, multilingual thesaurus, e-mail, and much more!